MTV EMA 2014 winners have been announced Sunday, November 9, 2014, in Glasgow, Scotland. Big winners in this 21st edition of the MTV Europe Music Awards (EMA) are One Direction, with 3 awards, as well as Ariana Grande, Katy Perry and 5 Seconds of Summer each having 2. For the 3rd consecutive year, someone from China won the Best Worldwide Act. 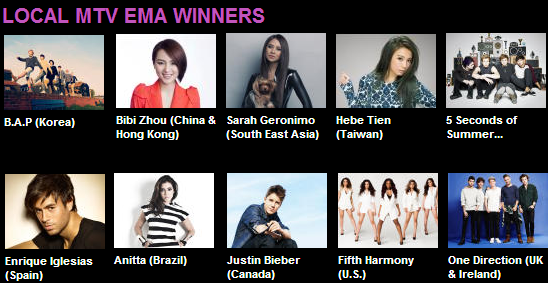 She's Bibi Zhou, the one who defeated our very own Sarah Geronimo for a slot in that category. Sarah was one of the local or regional MTV winners. 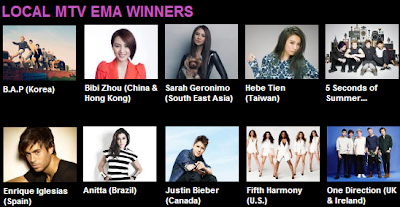 It was her 2nd consecutive year to get nominated for the Best Southeast Asian Act and her 1st time to win the title. But she later lost when she was pitted against the regional winners from Mainland China and Hong Kong (Bibi Zhou) and Taiwan (Hebe Tien). Zhou won, which earned her an entry to the Best Worldwide Act category.